Editor’s note: This post is brought to you by Visual Composer. Visual Composer is a well-known name in the web development industry. However, there have been some changes lately that left many of our users and long-time partners confused. You might have noticed that you do not see the Visual Composer Page Builder name around anymore. Once upon a time, it was a name that appeared on the most popular WordPress themes, so where did it vanish? The purpose of this article is to clear the confusion and to explain what happened to Visual Composer, why its name changed, and how it all happened. Before we get deeper into the story, we would like to apologize to all our users and long-time partners for the confusion we have created. Now let’s go step by step through what happened to the Visual Composer Page Builder. Why was Visual Composer renamed? The truth is that we did not really want to rebrand our product, but we did not have a choice. It all began with our new product – the Visual Composer Website Builder. For the record, the Visual Composer Page Builder and Visual Composer Website Builder are two entirely different products used for different purposes. VC Website Builder is not the new name of the Page Builder, and the two should not be confused. We will get into the detailed description of the difference between the two in a moment. But let’s start by saying that the Page Builder is an Envato-exclusive product with a lifetime license – like all products sold with Envato. The VC Website Builder, on the other hand, needed a different model. Since it’s a much more complex product, it was immediately clear that the lifetime license will not be able to support all the high development costs. With that in mind, we decided to stray away from the lifetime license model and switch the VC Website Builder to the yearly license model. Unfortunately, this was not as easy to do as we initially thought it would be. And that’s because we missed a crucial detail – out contract limitations with the marketplace. It turned out that we were not allowed to sell another product under the name of the Visual Composer outside the platform. We could change the name of Visual Composer Page Builder so we can lift our contractual limitations with the marketplace that sold it. We could cut a whole bunch of features off our new product so the development costs go low enough to fit the lifetime license model. It was not an easy decision to make because neither option was perfect. However, we believed that option 1 was the lesser of two evils because it did not force us to compromise the quality of our new product. We took a long thought, and we renamed the Visual Composer Page Builder into WP Bakery. If you want to know more details about this story, check out the video below. Unfortunately, we did not anticipate the confusion the name change would create. Users had no idea what happened to the VC Page Builder, what VC Website Builder was, why something called WP Bakery suddenly appeared and so on. Looking back, we now know that we should have informed people of this situation from the very beginning. And we hope this post will give you more clarity regarding these confusing changes. 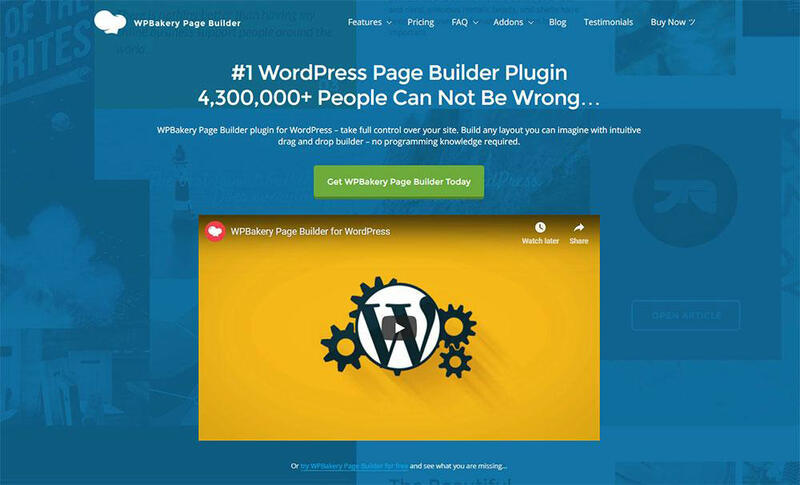 With that in mind, let’s take a better look at our two plugins: Visual Composer Website Builder and WP Bakery, and see what sets them apart. WP Bakery is just the new name for our first plugin, Visual Composer Page Builder. Behind the name of WP Bakery, you can find the Visual Composer Page Builder hidden with all its features and everything you loved about it. The new name did not change anything else about the VC Page Builder. 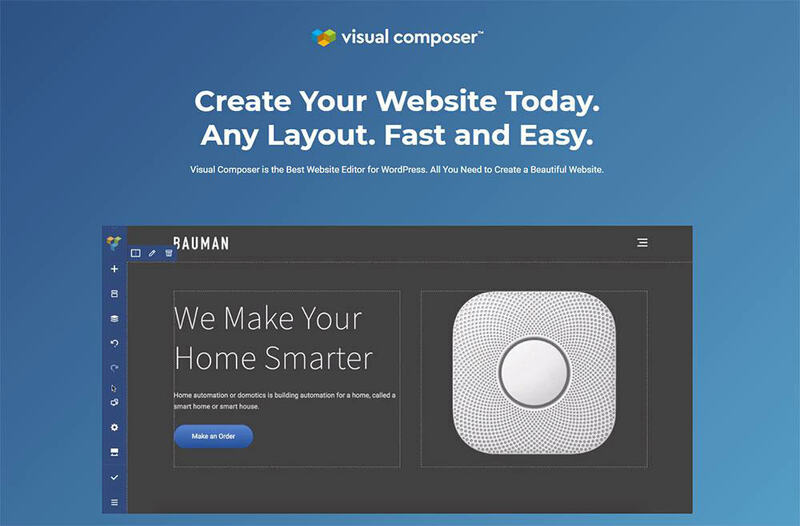 Visual Composer Website Builder is our brand new product, NOT a premium version of the Visual Composer Page Builder. This new tool allows you to build an entire website from scratch quickly and easily. It’s got drag-and-drop features and a wide variety of WP templates for different types of pages such as product pages, portfolios, landing pages, corporate websites, and many more. It can be used with any WP theme, including the ones you already use. Page editing works in two ways; frontend editor and tree view. The tree view allows you to see all the changes in real time thus saving you a lot of time during the process. The Visual Composer Website Builder comes in two versions; the free and Premium version. While the Premium version comes with a number of additional features, one that really stands out is the possibility to access the header, footer, and sidebar editor. 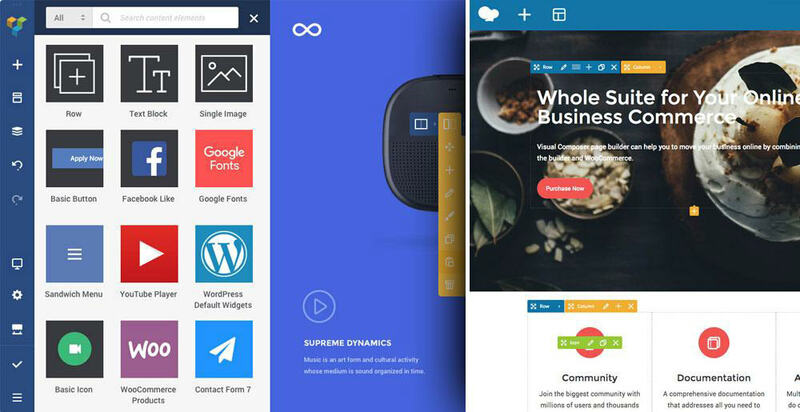 What is the difference between WP Bakery and Visual Composer Website Builder? Think of the two as entirely different products. The shortest explanation is that with Visual Composer Website Builder, you can build an entire website from scratch. WP Bakery, on the other hand, can only be used for the content part. On top of that, WP Bakery is shortcode-based, while VC Website Builder does not use any WP shortcodes. This means that VC Website Builder allows you to generate a clean code and it does not get messy when you disable the plugin. Another cool perk of the VC Website Builder is the fact that it comes with a cloud-based Hub where you can find interesting and useful add-ons and other elements that you can use to turn your vision into reality. To see the complete list of differences between WP Bakery and VC Website Builder, click right here. Both of our products come with a bunch of individual benefits, and we are continually working on improving both of them. The development of our new product doesn’t mean that we have forgotten about WP Bakery. We care about our customers, and we want to provide the best customer experience possible. Once again, we want to apologize for the confusion around Visual Composer and thank you for reading our complicated story. If you still have questions you’d like to ask us about one of our products, leave the comment and we will get back to you as soon as possible.